A rolling door is a large heavy object that moves with the help of springs under extreme tension and electric motors. Moving objects, springs under tension and electric motors can cause serious injuries or death. For your safety and the safety of others, follow these instructions. 3. DO NOT PERMIT children to play with the roll up door. Children could get caught between the door and the floor causing serious injury or death. 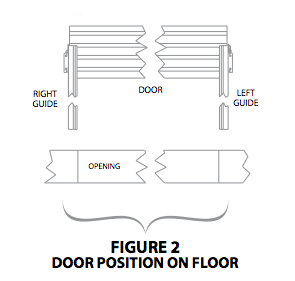 This guide main function is to assist the installer in correctly mounting doors with due regard for safety, operation, and sound construction practices. Reference must be made to construction codes in your area. All Roll up doors direct Doors follow the general instructions contained herein. 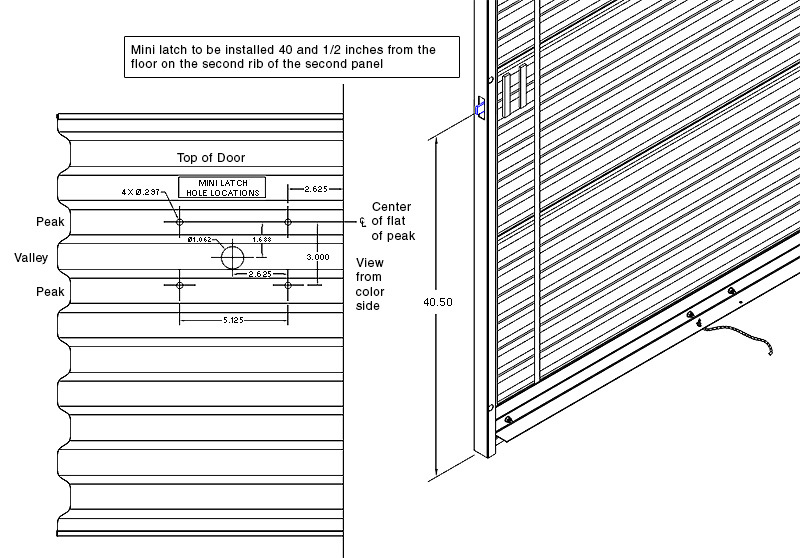 Additional installation information for the specific door shipped is found with the packing slip and on supplementary drawings. There are also bolt and small sealed parts bags with accessory lists, describing proper application. Check the roll up door opening dimensions and available clearances versus the dimensions listed on the packing slip. Be sure that the dimensions are correct for the opening you are working on, taking special note of the opening width and height. Be sure that the required clearances listed on the Dimension Tables in this manual are available prior to installation. Electric drill with 3/8" or 1/2" chuck with nut driver bits. Masonry drill or impact hammer and bits. Chain hoist and sling for raising barrel and curtain assembly. Scaffolding, Mechanical Lift, and/or Ladders (ladders not recommended for larger doors). Wrenches, vise grips, C-clamps, torque wrench, and a large pipe wrench. Plumb line, tape measure, chalk line, and a water level. Roll Up Doors shipped by common carrier arrive at the job site packed in cardboard. Before removing the roll up door from the packaging, inspect the roll up door and packaging for visible signs of damage. If damage is noted, file a freight claim with the freight company immediately. Remove the door from the packaging. Do not cut tape and plastic wrap that holds the door in a roll until you are directed to do so in step 6B. 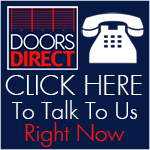 Roll Up Doors Direct cannot guarantee or accept responsibility for doors that are not installed as directed. Please read and understand all instructions before beginning the installation process. No guarantee will be given by Roll Up Doors Direct if the roll up door is not erected as instructed. For best operation, follow the instructions step by step. Please review all instructions thoroughly before starting installation. A. Check wall opening width and height and verify these measurements against size of door to be installed. B. Verify that jambs are plumb. C. Check floor and header for level. D. Check for adequate side clearance at jambs and clearance above and at sides of header. Check horizontal and vertical headroom requirements. See clearance charts figure 1 for minimum requirements. E. Verify that the guide mounting surface on the jamb is flush. F. Make sure all parts required for installation are with the door. A. Make sure floor is clean in order to prevent damage to curtain. B. On inside of building, place left guide on floor perpendicular to opening with guide bottom close to the left jamb and the top toward inside of building. Do the same with the right guide to the right jamb. See figure 2. C. Place door on floor at top of and between guides. Rotate door as necessary to locate bottom bar against floor. See figures 2 and 3. D. Distribute hardware parts to appropriate areas. NOTE: Brackets, tensioner, spring(s) and curtain mounted latch are pre-assembled to the door at the factory. Do not remove. A. 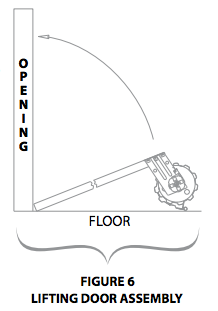 At tensioner end of door, lift flange on tensioner pawl until end of the pawl clears the tensioner ratchet wheel. Rotate bracket in order to position short leg end upward. Release flange on pawl and allow end to engage with the nearest tooth on the ratchet wheel. See figure 3. B. Bring top end of guide in alignment with bracket and insert hooks on bracket into slots in guide. C. Slide bracket and guide together until locking tab in guide fully engages notch in bracket. 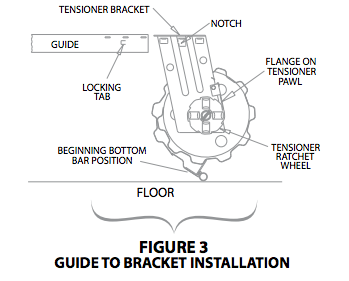 D. If locking tab does not fully engage with bracket notch, use a hammer and punch to bend tab into bracket notch. E. Repeat steps 3B through 3D for non-tension bracket and guide. The bracket will require being held in position. Locking tab in guide must fully engage with notch in bracket. Failure to do so may allow the door to fall during installation, which can cause serious injury or death and/or damage to door. NOTE: For opening heights over 8'-8", clamp bottom of brackets to guides with locking pliers in order to ensure rigidity of top of guide while lifting. Remove pliers after securing brackets to jambs. A. Move door and guide assemblies toward wall opening with bottom of guides resting next to jambs. B. Lift door assembly evenly, pivoting around bottom of guides. See figure 6. 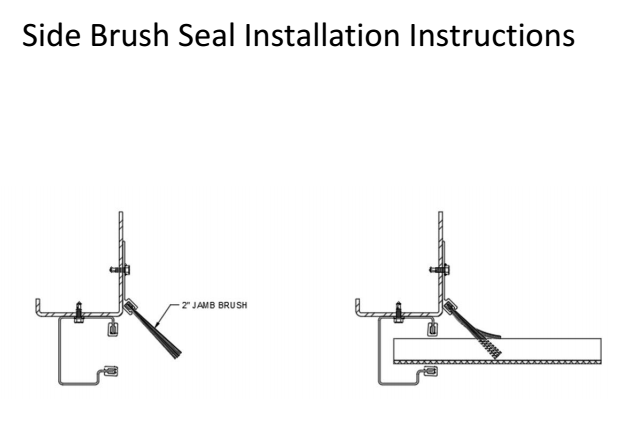 Two installers are required to lift door assembly into position against jambs. The guides are not designed to support the door weight during a one man installation. Attempting installation with only one installer can result in serious injury and/or damage to door. Do not leave door unattended until it is securely attached to jambs. A. Attach brackets and guides to jambs using fasteners shown in table 1. B. The guides should be mounted centered about the opening and spaced curtain width + 1" apart measured from back of guide to back of guide. See figure 7. Both guides must be plumb. C. The appropriate fastener must be installed at each hole location in brackets and guides. See table 1. Table 1: Wall Fasteners included for jamb attachment of Brackets and Guides. Door can fall if both brackets are not securely fastened to the jambs. All fasteners attaching brackets to jambs must fit securely into a structural member or surface. If door falls, serious injury or death and/or damage to door can result. B. While firmly holding the door at the bottom bar, cut the tape and plastic wrap that holds the door in a coil. Direct the bottom bar down into the guides, stopping just past the head stop area and hold securely through completion of step 7. Extreme spring tension can cause serious injury or death. Installation, repairs and adjustments must be made by a trained rolling service door systems technician using proper tools and instructions. The Roll Up Door must be fully opened when making adjustments. A. Slide head stop from inside of each guide. See figure 8. B. Secure each head stop to guide with 1/4-20 x 1/2” thread cutting type F hex screw. A. Install stop clip at each end on inside of bottom bar using existing single 1/4-20 x 5/8" carriage bolt and nut. See figure 10. B. Install handle(s) on outside of bottom bar using 1/4-20 x 5/8“ carriage bolts and nuts. C. Install rope in one of the holes at the center of the horizontal leg of the bottom bar angle. 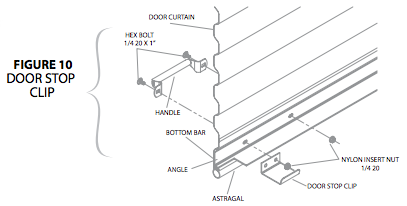 Optional: Bottom bar mounted slide locks - See figure 9 for installation. A. Lower and raise the door to test the door balance. B. If door is easy to close, but hard to open; increase spring tension. C. If door is hard to close, but easy to open; decrease spring tension. A. Place 3/8" diameter winding bar in tensioner ratchet wheel. See figure 11. B. Rotate winding bar in the down direction to increase spring tension. Each engagement of a tooth equals 1/8 turn. C. To decrease spring tension, pull down slightly on winding bar until pawl disengages tooth. Lift flange on pawl and move winding bar up until past the pawl/tooth engagement. Allow pawl to rest on ratchet wheel and continue moving winding bar up until the pawl is fully engaged with the tooth. D. Remove winding bar and operate door. E. Repeat steps 10A through 10D as necessary. *Note: Latch slide slot in the guide may require adjusting after door installation due to variances in manufacturing and/or site conditions. This video shows how easy it is to fit one of our commercial units, it should be viewed in conjunction with the installation manual.